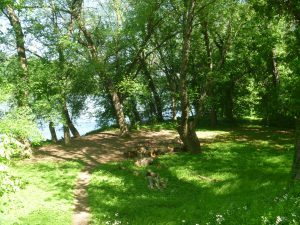 The Bald Eagle Island campsite is located just north of the narrow Point of Rocks section of the Potomac, a historic point of contention between the Canal and the B&O Railroad for right of way. Claiming it had rights to the land along the Potomac through this narrow section, the Canal sought an injunction against the B&O Railroad when it tried to buy the same land. The Canal won its battle, and the railroad would need to tunnel through the Catoctin Ridge. The railroad would later re-build tracks within the failed Canal bed. The same narrow passageway that brought the Canal and the railroad so close together is the reason why overnight campers at the Bald Eagle Island campground will never be far from the sounds of passing trains. Earplugs for sleeping are recommended. Be advised that the closest campsite upstream is 12.5 miles.